Killer B Hive reminds you to be safe and have fun! Here's some more "Halloween-themed" goodness with everyone's favorite paranormal investigator and all-around lovable demon hunter, HellBoy! "WEEEELLLL! Well, it's the Big Show!" Originally I wanted to have a "Monster Week" leading up to Halloween on Sunday, alá Toy A Day's "Monster October", but that plan crumbled due to several set-backs. However, I still wanted to knockout a couple of "monster"-related reviews, and today's fits into that category, albeit loosely. Now, you may say "3B, the Big Show's not a monster." and to that I will reply, "Oh, yes, he is! He's a monster of a man at well over 7 feet tall! That qualifies as a monster to me. Now sit back and read the review or Show will eat your kids!" 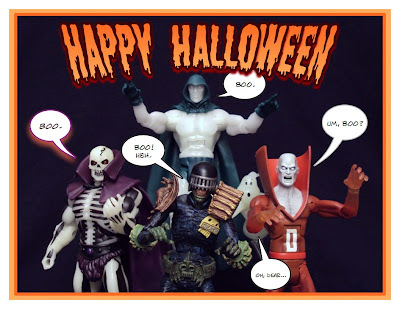 Over on Toy A Day, Novelty's celebrating "Monster October" with reviews of monster-themed action figures and I just had to join in on the fun. Go check out my review of the Wolfman Mez-Itz on TaD now! I wanted to save this review for St. Patrick's Day, but by then he may have another Elite figure out. So pucker up and give him a kiss, he's Irish! Here's a look at what's on the shelves this month! Hey guys, it's Novelty from Toy a Day, buzzing by to put up this review here, since it's almost insect related. OK, a spider isn't really an insect, but it's close enough. The said spider comes with Anton Arcane of Kenner's Swamp Thing line of 1990 and I opened it today as part of Swamp Thing week of Monster October at Toy a Day. Swarm in to read more! Today I'm reviewing one of my all-time favorite pro-wrestlers, the uproarious, masterfully mischievous, the incomparable, "Rowdy" Roddy Piper! Today we're taking a look at a figure from Mattel's WWE Basic line, Kelly Kelly! The Diva so nice, they named her twice!!! A few interesting news items related to Green Lantern, Spider-man and Superman! First up, the official site for Warner Bros. Pictures' Green Lantern has gone live with a teaser of what else? A Green Lantern logo! Not much right now, but I'm sure things will start to pick up during the Thanksgiving holiday week. Check it out here. In Spider-man reboot news, Emma Stone has been chosen to play Gwen Stacy in the upcoming film directed by Mark Webb and starring Andrew Garfield as the web-head. And finally, and probably hugest of recent news, Zack Snyder, director of "300", "Watchmen", and the upcoming "SuckerPunch", has been tapped to direct the new Superman reboot, tentatively titled: "Superman: The Man of Steel". If you don't already know, Christopher Nolan (Memento, Insomnia) is producing the film with a script by his brother and "Inception" co-writer, Jonathan and "Batman Begins/The Dark Knight" collaborator, David S Goyer (Blade Trilogy). Also, General Zod was confirmed to be the main villain in the film. Ghostbusters fans rejoice! We finally have the complete team in uniform! Actually, Peter is still slimed... and if you already had the SDCC Egon, then you finished your team with the June release of Venkman. So if you're like me, you're still waiting for Peter's November release, too. Forget rejoicing... continue lamenting. 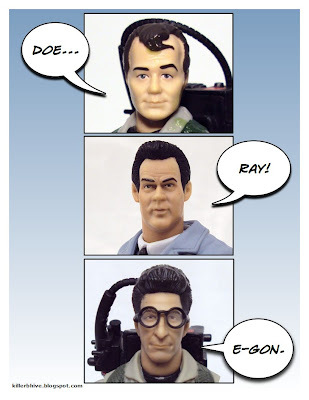 But put that on pause for a few minutes while we look at the September GB release of Egon Spengler (sans slime)!